Tiger Woods...Greg Norman...Ben Hogan...What secret do these and nearly all golf legends share? The answer is identical swing tempo. This startling discovery was made by John Novosel as he studied film footage of the PGA greats. He was searching for the key that made their swings so effortless and powerful, and he found out that nearly every champion demonstrated the same tempo in their swings, a common ratio between takeaway and downswing. His breakthrough book, Tour Tempo, published by Doubleday in 2004, was an instant classic, an international best-seller and has been translated into Japanese and Spanish language editions. Its central argument -- that tempo, the most important fundamental of the golf swing, can be learned quickly and easily without expensive lessons or exhaustive practice -- is now accepted by swing coaches at every level of the game. Tour Tempo's premises have been validated by an Independent Scientific Study performed by the Departments of Physics and Biomechanics at Yale University. The Titleist Performance Institute has also confirmed our research. The book included instructional videos and the now famous Tour Tempo Tones. These gave golfers what they have been searching for all these years- immediate and dramatic improvement. And now over 100,000 golfers worldwide, from beginners through Major Championship winners on the PGA Tour, have immediately and dramatically improved their games by using Tour Tempo. 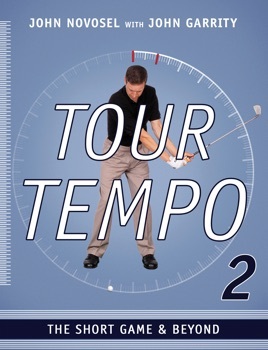 But Tour Tempo, now in its 11th printing, covered only the full-swing shots. Now Team Novosel and John Garrity are back with a sequel devoted to the short game -- the putts, chips, greenside pitches and bunker shots that make up the majority of strokes played in a round of golf. Tour Tempo 2 includes a download link to the new Tour Tempo short-game tones and the videos that explain exactly how to incorporate them into your golf game. Simply by practicing to the short-game tones, the weekend golfer can master the correct rhythm in minutes. Got the dreaded "yips" with your putter or chipping club? TT2 has the cure. Can't hit those short game shots from 40 to 60 yards? TT2 gives you the feel for the tournament player's favorite stroke saver. Terrified of greenside bunker shots? TT2 reveals the tempo secret that makes sand play so easy for tour pros. Tour Tempo 2 is more than a short-game tutorial. The full swing is explored in several chapters that pick up where the first book left off, including a cutting edge revelation - about how you can combine Physics and Tour Tempo to achieve a consistently powerful golf swing that you might never have thought possible! For more information about the authors and TT2 - go to the Tour Tempo website. Help me realize my swing tempo, also open my eyes to why my long game is on point but my short game would suffer or vise versa during a round there are two different tempos. During a round I was stuck on one tempo either 3:1 or 2:1 for every shot, now my scoring for a golf round has drop dramatically. Thanks Tour Tempo!